Buffalonians! I'll be at this! My acceptance came yesterday and I'm super excited! The show runs at the same time as the Elmwood Arts Festival along the same part of the Elmwood strip. So go to the festival at the end of August and stop in the church to say hi! 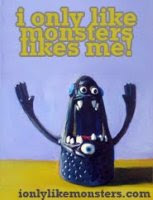 I have so many new monsters for you all! Also, I made progress on my drawing for the 52 project... enough to call it done! Early!? Imagine that. I'm still going to post on Wednesday, but here is a little teaser in the meantime. Last weekend was the show at Filigrees on Elmwood Ave. and I uploaded a whole album of pictures from that event on the erinmakesstuff facebook page. Check them out! I'm still figuring out settings on the new camera, but so far it's been a whole lotta <3. Until next time, take care and, if you're in the US, enjoy your 4th of July!